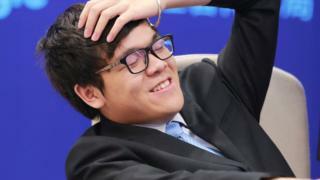 Google's DeepMind AlphaGo artificial intelligence has defeated the world's number one Go player Ke Jie. AlphaGo secured the victory after winning the second game in a three-part match. DeepMind founder Demis Hassabis said Ke Jie had played "perfectly" and "pushed AlphaGo right to the limit". Following the defeat, Ke Jie told reporters: "I'm a little bit sad, it's a bit of a regret because I think I played pretty well." In Go, players take turns placing stones on a 19-by-19 grid, competing to take control of the most territory. It is considered to be one of the world's most complex games, and is much more challenging for computers than chess. AlphaGo has built up its expertise by studying older matches and playing thousands of games against itself. The company says the eventual plan is to deploy its artificial intelligence "in areas of medicine and science". Prof Noel Sharkey, a computer scientist at Sheffield University, said it is still a long way from creating a general intelligence. "It is an incredible achievement and most experts thought an AI winning at Go was 20 years away so DeepMind is leading the field but this AI doesn't have general intelligence. It doesn't know that is playing a game and it can't make you a cup of tea afterwards." Prof Nello Cristianini, from Bristol University, added: "This is machine learning in action and it proves that machines are very capable but it is not general intelligence. No-one has built that yet." The types of intelligence exhibited by machines that are good at playing games are seen as very narrow. While they may produce algorithms that are useful in other fields, few think they are close to the all-purpose problem solving abilities of humans that can come up with good solutions to almost any problem they encounter. Prof Cristianini added that while competition at a gaming level is fine, it should not govern how we view our relationship with intelligent machines going forward. "We should focus on the good things that we can get out of them and be careful not to create situations in which we put ourselves in direct competition with machines." Both experts agreed that such algorithms could be adapted to other fields, such as health care. DeepMind has already begun working with the UK's national health service to develop apps and other tools for diagnosis.